Cabbage Sausage Skillet is a quick lunch or dinner meal which tastes great any time of the year. At the same time, the sausage and cabbage skillet is an inexpensive meal and is a great idea when you don’t know what to cook. I prepared a quick video further below where I show how I make this delicious cabbage and sausage skillet from scratch. I have a couple of lunch and dinner meals in mind when I am hungry, craving for good taste but out of cooking ideas. 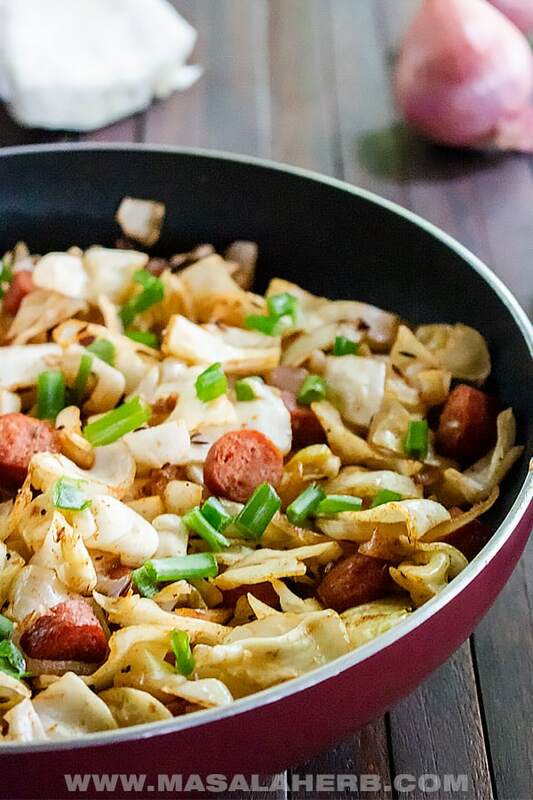 This quick and easy cabbage sausage skillet is one of those useful pan-fried, no hassle meals. You will find more of these skillet recipes here in the future. For now, you can check out these skillet recipes if you are looking for some inspiration. Cheese Eggs Potatoes Skillet – Not a breakfast dish! This is a whole meal from the Austrian/Bavarian Alps. 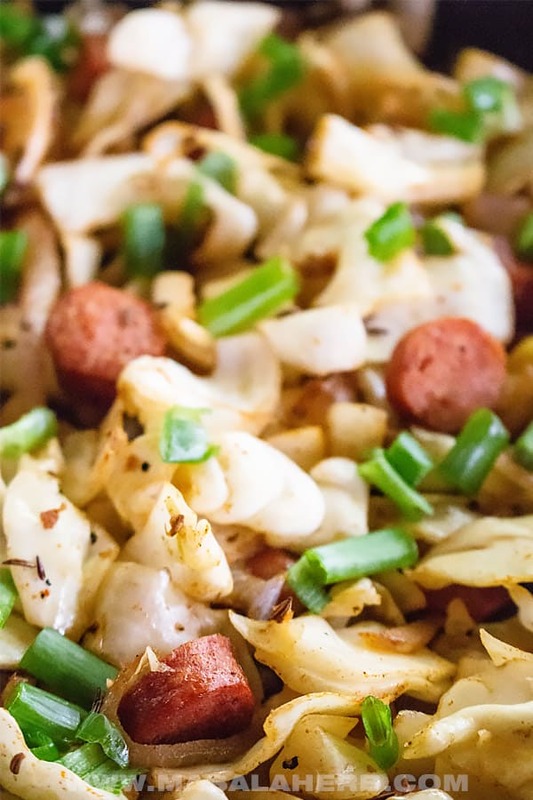 The beauty of this quick and easy cabbage sausage skillet dish is that you can adapt it to your liking with the ingredients from your pantry or your local grocery store. Cabbage is the main vegetable in this recipe and it’s often an overlooked and forgotten veggie. Yet the humble Cabbage is packed with fibers which are good for your digestion. In this cabbage quick fy I used regular white cabbage, however, feel free to use red cabbage instead of the white cabbage variety. So, while we usually prepare Sauerkraut and serve the Sauerkraut with Sausages, enjoying cabbage in a quick stir fry or raw in a salad is also beneficial for your health. I love to just barely stir-fry the cabbage in the skillet with the sausage slices. The cabbage adds texture as it remains crunchy. The Seasoning is quite interesting and is very Central/Eastern European influenced with Caraway seeds and Paprika dominating the aroma of this cabbage sausage skillet dish. Do not substitute the caraway seeds with cumin, it wouldn’t be the same. Using whole caraway seeds is definitely the way to go for this dish and shouldn’t be left out. You get to choose which sausage! I used a variation of smoked Frankfurter sausages in my pictures. Most sausages can be found in the fresh or frozen section of most supermarkets. A good sausage is usually made of pork, beef, veal or mutton meat. You could use something like turkey or chicken sausages… but well the taste experience is just not the same. BTW: Wurst is German and means Sausage translated. Did I miss a sausage? Please share your favorite skillet sausage with us in the comments further below. 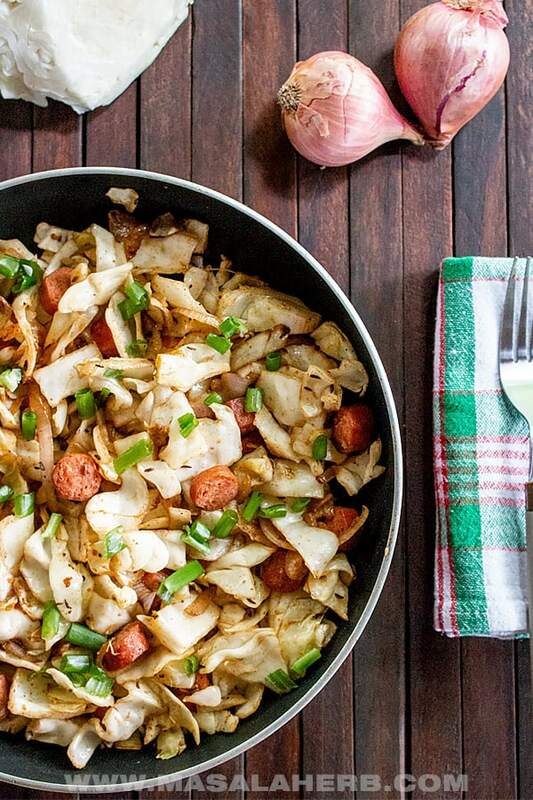 How to make this cabbage sausage skillet? 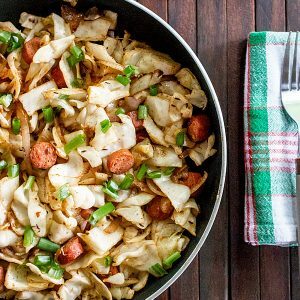 The cabbage sausage skillet is a quick, easy, flavorful dish. This is a meal for all those who crave good comforting flavors with the minimum amount of work. Besides it’s budget-friendly meal. I usually use non-stick PFOA free skillet pans because, well foods don’t stick and I tend to use less oil. I really don’t like oily food, so for me, it’s important that I use less oil and that the food doesn’t stick on. I get super frustrated when I just turn around and the food starts to stick in the pan! When buying non-stick skillet pans you need to get the quality PFOA-free non-scratch skillets. This is important because regular non-stick pan (with the PFOA) have a layer of health-damaging chemicals which can cause cancer. Many companies still produce those and they usually don’t disclose this at all. So keep an eye out for the more expensive but non-toxic cookware. As an alternative, I like to use stainless steel pans too because they are sturdy and the food cooks evenly quickly as well. More Cabbage meals for the Cabbage lover! Quick and easy flavorful skillet meal with cabbage and sausage as star ingredients. The cabbage lends the dish texture and a healthy touch, the sausage makes you want to have more and the seasoning creates the aroma needed for you to love your dinner. Filling budget weeknight meal idea. Heat up a pan and add the oil. Add your sliced onions to the pan and stir-fry for a minute. Then fry your onions until translucent and soft. Add in your chopped Garlic and stir fry quickly. Fry the whole content for another 1-2 minutes or until the onions get slightly yellow. Take down the heat or take the pan for a minute form the heat to add the spices. Add one by one the spices, Caraway seeds, Paprika powder, Black Pepper, and Salt as well. Take the pan back to the heat and stir fry the contents on higher heat for a minute. Reduce the heat and fry for another 2-3 minutes. Now it’s time to add in the chopped cabbage. Mix the cabbage into the skillet content. Stir-fry for 3 minutes on high heat, then reduce heat and let cook further for 1-2 minutes without mixing further. Garnish with cut chives and serve still hot. I usually like to use Franks or Wiener sausage for this cabbage skillet. 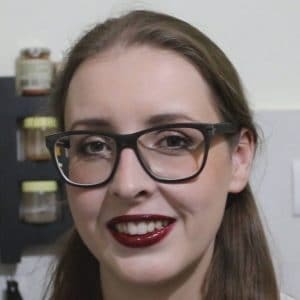 For sausage suggestions, read up in the post. 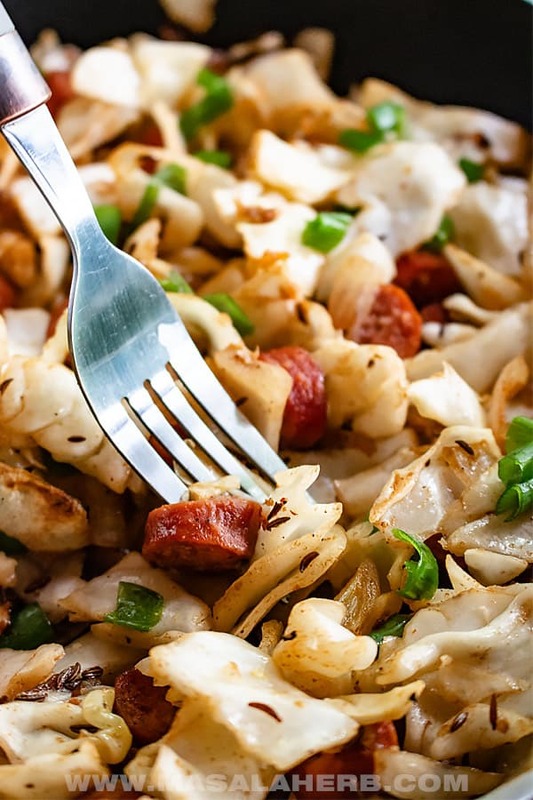 Hi, this may be interesting you: Quick Cabbage Sausage Skillet!